As the political indicators grow more ominous for the Republican congressional minority nationally, we’re sensing a slight improvement in Democratic chances to flip U.S. House seats in Pennsylvania. In our latest periodic ranking of most vulnerable seats in the state’s congressional delegation – our first since June 11 – no fewer than five Republican-held seats rate as “highly vulnerable” and four others rate as “vulnerable.” By contrast, Democrats have one “highly vulnerable” seat and one “vulnerable” seat. As always, we rank the districts in descending order, from most vulnerable to less vulnerable. Here’s the list as it stands now. We’ll update it as Election Day approaches. 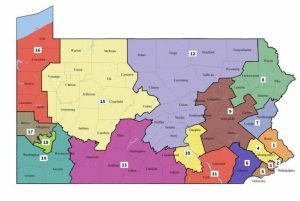 This race has been quieter than most competitive seats in Pennsylvania, perhaps because both parties agree that it’s almost certain to switch partisan control in 2018. Hillary Clinton would have won the district by 28 points, and the seat became open following the allegations of sexual harassment against Meehan – and the lines were redrawn to the Democrats’ benefit by the Pennsylvania Supreme Court. Democratic nominee Mary Gay Scanlon, an education advocate, actually trailed her Republican opponent, former prosecutor Pearl Kim, in cash on hand at the end of the second quarter. But we expect Scanlon, a successful fundraiser during the primary, to reverse that pattern when the third-quarter numbers are released in a few weeks. This race has also been quiet in recent months, as Chrissy Houlahan, a Stanford- and MIT-educated Air Force veteran and businesswoman, remains a formidable frontrunner against Greg McCauley, a former Wendy’s franchise owner. This open Republican-held district supported Clinton by 10 points. When we published our previous rankings, Houlahan was outraising McCauley by a 38-to-1 margin; since then, her advantage has grown to 55-to-1. As with the previous two districts, this contest has been fairly quiet in recent months. It’s a rarity in Pennsylvania this year – a vulnerable Democratic-held district, thanks to incumbent Democrat Conor Lamb’s decision to vacate it to run for a friendlier seat further north. State Sen. Guy Reschenthaler, a former judge and Navy veteran, won the Republican nomination, while Bibiana Boerio, a former senior automobile executive and an aide to then-Rep. Joe Sestak, is the Democratic nominee. Democrats like Boerio, but the district would have supported Donald Trump in 2016 by 20 points, so it’s a steep climb even with a Democratic wave. Former Allentown solicitor Susan Wild, the Democratic nominee, was narrowly ahead of Lehigh County Commission chair and Olympic cyclist Marty Nothstein, the Republican nominee, in a recent Monmouth poll, either by two points or six points, depending on the turnout model used. The district would have given Clinton a one-point win in 2016. But at the end of the second quarter, Wild had four times as much cash on hand as Nothstein, and the Monmouth poll found Trump modestly under water in the district. While this remains a competitive race, Wild is a modest favorite. This contest – between Lamb and the district’s Republican incumbent, Rothfus — remains in the fifth spot on our list, but it moves up a notch from “vulnerable” to “highly vulnerable.” A Monmouth poll from July had Lamb up by double digits in various turnout scenarios, and it found Trump seven points under water in the district, despite backing Trump by two points in 2016. Lamb, already well-known in the Pittsburgh media market during his special election bid, had roughly as much cash on hand as Rothfus according to the second quarter reports — an impressive feat for a challenger. In an ominous sign for Rothfus, the National Republican Congressional Committee – the House Republicans’ campaign arm — canceled four weeks of ad spending , although America First Action, a Pro-Trump PAC, has invested in the race instead. If the trend lines for this race continue, it could end up higher on this list. This is a rare Democratic pickup opportunity that looks more challenging than it did a few months ago. Republicans are taking advantage of Democratic challenger Scott Wallace’s background, including allegations of a $70,000 tax lien and controversial actions by the Wallace Global Fund, a family foundation he led. But Wallace is able to self-fund, and the district is narrowly divided, so it should remain competitive. Republicans are optimistic that self-funding challenger John Chrin, a former managing director at J.P. Morgan Chase, will make a serious run at Cartwright in this Trump-friendly district. The fact that the incumbent agreed to a series of debates with Chrin suggests that, at the very least, Cartwright is not taking the race for granted. Cartwright, an attorney well-known in the Scranton portion of the redrawn district, is trying to spotlight Chrin’s Wall Street background, while Chrin is seeking to tie Cartwright to House Democratic Leader Nancy Pelosi. In a Democratic wave election, it’s hard not to bet on a Democratic incumbent, but this race bears continued watching. Democrats are also enthusiastic about this district, and while we’ve dropped it a notch on our list, we’re still moving it up from “potentially vulnerable” to “vulnerable.” Democratic nominee Ron DiNicola is familiar in the district as a Marine boxer and narrow loser (several maps ago) in a 1996 U.S. House contest. In Kelly, he’s facing a long-serving incumbent representing a Republican-leaning district, but Kelly wants a series of debates, which suggests he understands the degree of danger he’s in. If incumbent Republicans across the country continue to look imperiled, Kelly could be one of those to go down. Neither party appears to be paying much attention to this district, which is solidly pro-Trump. But Democratic nominee Dennis Wolff is a surprisingly strong candidate for the district – he’s a well-liked dairy farmer and a former state secretary of agriculture – and at the end of the second quarter, he actually had a bit more cash on hand than the GOP nominee, former state revenue secretary Dan Meuser. We’d be surprised if Wolff pulls this out, but it’s not an impossible task, so we’re leaving this contest on our list for now. I think your assessment of Cartwright is accurate because if a millionaire is throwing money around like water you can’t ignore Chrin. However, there is also a saying a fool and his money are easily parted and this where Chrin is not clicking. His blabbering on about Nancy Palosi may be big news is Alabama it is not so much news in the Cartwright district and again Chrin is also missing the mark on healthcare. His adds suggesting voters clamor for no change in healthcare is an error from someone who really doesn’t know the district. I think millionaire Chrin will lessen Cartwright’s totals but not win. Is it worth it? You tell me but remember a fool and his money are easily parted. All the prominent labor endorsements and boots on the ground. As a republican he will cream Wallace. Unless people look into him being a member of the Bros Caucus with his buddy Duncan Hunter. He likes the social scene down in DC. Pretty much conventional wisdom. Wasn’t aware that Kelly’s seat could be in play. That is a heavy Trump area. Fitzpatrick is more vulnerable than many think. His ads on Wallace come off as desperate. The ones that are buying into it are already his committed voters. On the fence voters smell the BS. Cartwright definitely could be vulnerable. Same with Perry although that would be a huge upset.